The Electric Imp impC001 Breakout Board and impExplorer™ Kit feature respectively two and four connectors compatible with a peripheral interface called the Grove system. The Grove specification defines a connector and a four-wire interface for hooking up peripheral devices, called ‘modules’, to a host microcontroller. Devised by Seeed, Grove is supported by a wide array of modules, and many of these you can connect to your impC001 Breakout Board or impExplorer as you evaluate the Electric Imp Platform or work on your connected product prototype. This guide will help you do so. It introduces the Grove specification with specific reference to its use with the impC001 Breakout Board and the impExplorer Kit (in both its imp001 and imp004m forms). It will help you understand what types of modules you can connect to these devices and how, and how you communicate with them through your Squirrel code. The Grove connector has four pins numbered one through four, as shown in the image below. 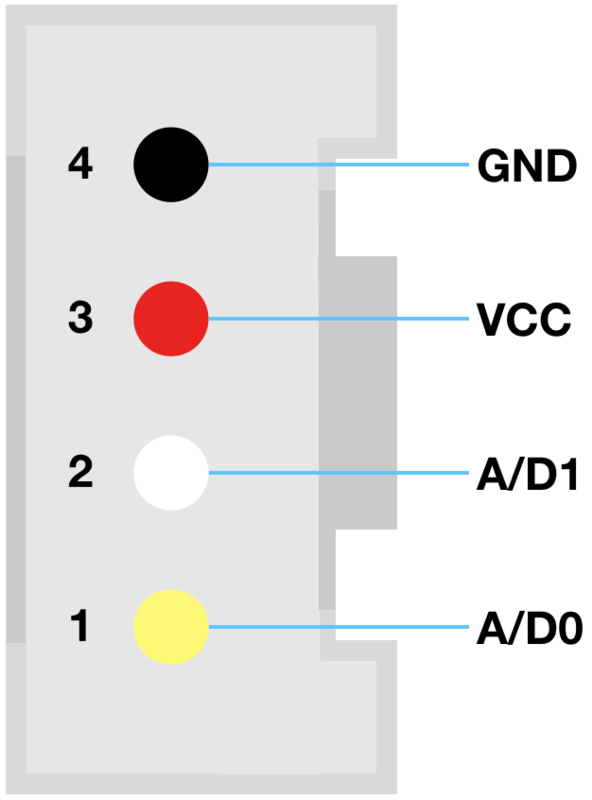 The cables are color-coded: red is power and black is ground; this is always the case no matter what peripheral you connect, but pins 1 (yellow) and 2 (white) vary in function according to the Grove module being connected. The connector and the port into which it fits are shaped to ensure there is only one way to connect them together. In digital mode, pins 1 and 2 are considered, respectively, primary and secondary digital input/output. Most digital Grove modules only use pin 1. However, a few modules, such as Seeed’s LED bar display, use both pins 1 and 2. The impC001 Breakout Board and the imp004m-based impExplorer are compatible with all modules, but the imp001-based impExplorer is compatible only with modules which use pin 1 only. For example, the Seeed 4-Digit Display uses pins 1 and 2 as, respectively, clock and data signalling pins. These can be accessed on the imp001 impExplorer with pin 8 and pin 9. This is supported by Electric Imp’s Grove TM1637 library, which provides an easy way to drive the display from your device code. Analog operation is an alternative mode to digital. Again most Grove modules only make use of pin 1, but some may use pin 2 too. There are many types of I²C Grove sensors available, and while most support 3.3V signalling, some are 5.0V-only, so check before buying. These devices will need intermediate level reduction to be used with either impExplorer or the impC001 Breakout Board, all of which only support 3.3V signalling. All Grove I²C connectors use pin 1 (yellow wire) as SCL (clock) and pin 2 (white wire) as SDA (data). The impC001 Breakout Board has only one I²C connector. It is wired up to the impC001’s hardware.i2cXDC bus. The imp004m impExplorer’s two I²C headers are both connected to the imp004m’s pins Q (SCL) and P (SDA). Tying two headers to a single pair of pins is not an issue because I²C supports multiple devices on the same lines: each device is signalled at a different address. Note that the imp004m impExplorer’s on-board sensors also connect via I²C through hardware.i2cQP. The imp004m impExplorer’s two I²C headers are both connected to the imp001’s pins 8 (SCL) and 9 (SDA). The imp001 impExplorer’s on-board sensors also connect via I²C through hardware.i2c89. The Grove specification provides for UART signalling, but this is not supported by the either the imp001 impExplorer or by the impC001 Breakout Board. However, the imp004m’s inner digital/analog connector supports UART RX and TX on pins C and D, respectively, which are accessed via hardware.uartBCAW (configured with NO_CTSRTS). Simple digital and analog modules are relatively easy to work with. Whichever Analog/Digital header that you connect the module to, you access it through that header’s pin 1 (imp001 impExplorer) or pins 1 and 2 (impC001 Breakout Board and imp004m impExplorer). More complicated devices, in particular I²C modules, will require slightly more complex Squirrel. Setting up I²C communications is straightforward, but you will need to examine the specific module’s datasheet to understand what commands you need to issue to initialize it and make use of it. Our article ‘I²C Explained’, will help you if you haven’t worked with I²C before. Fortunately, there is a growing selection of Electric Imp code libraries which support the sensors and other devices that form the basis for many Grove modules. These libraries can be easily added to your application code and provide simple APIs for accessing module features. In short, they do all the I²C heavy lifting for you, so you can focus on your application. For modules not yet supported with an Electric Imp library, there are generally simple drivers written by Seeed which support the module on the Arduino platform. These drives are usually very straightforward to convert to Squirrel, for which our guide ‘Porting Arduino Code to the imp’ provides full details.